As you know, an earthquake of magnitude 6.8 on the Richter scale and 10 km depth struck Shan State in Myanmar at 20:29:30 hrs Myanmar Standard Time on 24 March 2011. Since the earthquake and as of Sunday 27 March evening, a total of eight aftershocks have been reported from affected areas. The risk of landslides remains high. According to the reports, the epicentre of the earthquake was near Loimwe, located about 35 miles (56 kilometers) southeast of Kengtong in Shan State, and the ten locations affected included Tarlay, Mong Lin, Mong Yawng and Tarchileik towns and Kyakuni, Wan Lon, Pa Line, Kong Sar, and An-khan villages. The latest official number of casualties currently stands at 74 deaths and 125 injuries. However, according to witnesses this number could become higher in coming days. Over 300 houses and buildings, including a number of Government buildings were damaged. In addition, thirty-one (31) religious buildings have been damaged as well as eleven (11) schools. One 16-bed rural hospital in Tarlay was damaged. 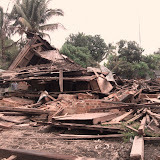 We are very sad to learn that the home of our friend's parents in Mong Lin was totally destroyed. Luckily, his family only suffered minor injuries. The damaged Tarlay Bridge, connecting Tachileik and Tarlay, has been temporarily repaired, enabling the re-opening of the road from Tachileik to Tarlay in the evening of 26 March. However, it is observed that the Bridge may not in a condition adequate for traffic by heavy trucks. Only light trucks, motorbikes, bicycles and pedestrians are advised to cross the Bridge. Access from Kengtung remains possible. The Tarlay Sub-Towhship Relief Committee, established by the Myanmar Government, has estimated the damage of the earthquake at approximately 3 billion Kyats (approximately USD 3.6 million). Some say that this is the third largest natural disaster in Myanmar after Cyclone Nargis (2008) and Cyclone Giri (2010). Hundreds of victims are still reportedly lacking access to food and aid even though relief supplies are being distributed from local and international communities everyday. Most villagers are still living in tents in front of their damaged and collapsed houses in unseasonal rains and cold weather. We are also hearing that well water is no longer drinkable with high sulphur content as a result of the earthquake. Moegyo team has contacted a local volunteer who can deliver blankets, food and water directly to the victims, and to begin immediately, we have already donated $500 to purchase the goods. But we need much much more. The victims need us to step up and help in this time of needs. If you wish to donate through Moegyo, please contact us and we will make sure your donations reach the victims. We will take photos of donated goods and will share them with you. If you know volunteers in the area who can visit victims and distribute aid, please let us know. Please see here some pictures taken by volunteers.